Finally today was our second meeting at Picto Benelux in Rixensart (BE). 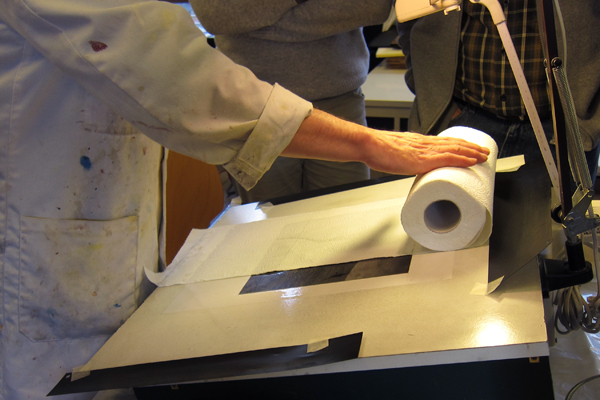 The topic treated was (brom) oil printing. It started with a short theoretical introduction and was followed by multiple demonstrations by different people. Extremely interesting as it was my first intro in oil-printing. It was quite fascinating and definitely made my list of things I want to know more about. The demonstration I followed the most was by Andre Devlaeminck and the following photos are of his work(ing). 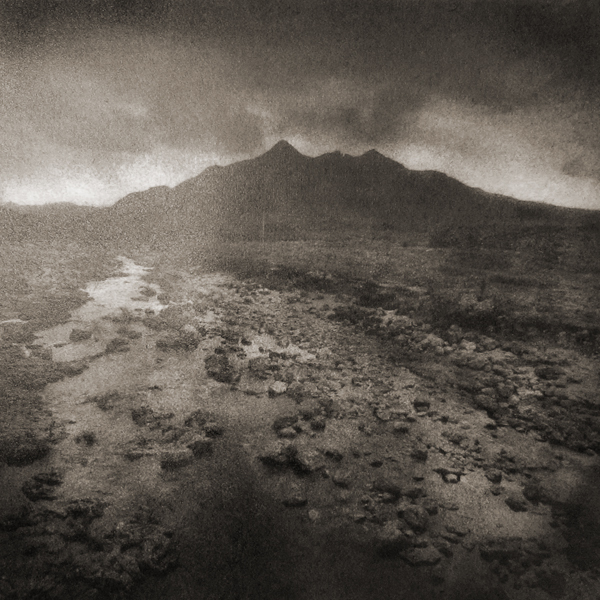 I’ll add a short description of the process (stolen from Wiki – too lazy to make up my own words now 😉 ) including differences between bromoil and oil printing. 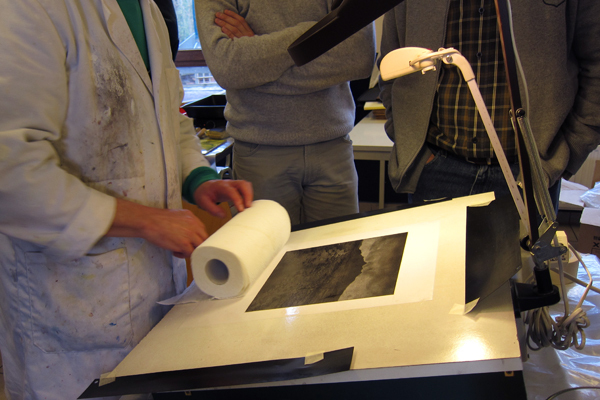 “To explain the bromoil process, it is helpful to look at the oil print first. The prints are made on paper that has been coated with a thick gelatin layer and has been sensitized with dichromate salts. Exposure using a negative for contact-print leads to hardening of the dichromated gelatin, in direct relation of the amount of light received. 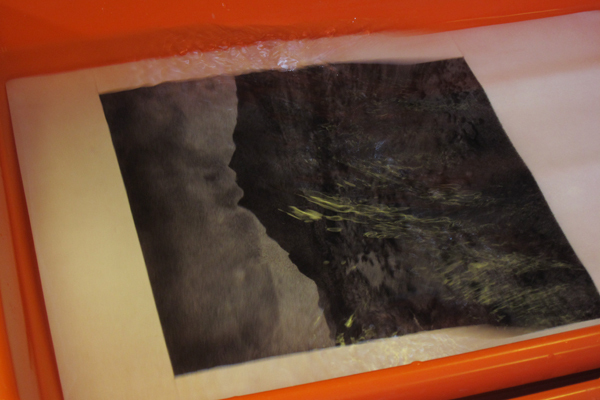 After exposure, the print gets soaked in water. The non-hardened parts absorb more water than the hardened parts, so after sponge-drying the print, while still moist, one can apply a lithographic ink to the oil-base. The non-mixing character of oil and water results in a coloring of the exposed parts of the print, creating a positive image. 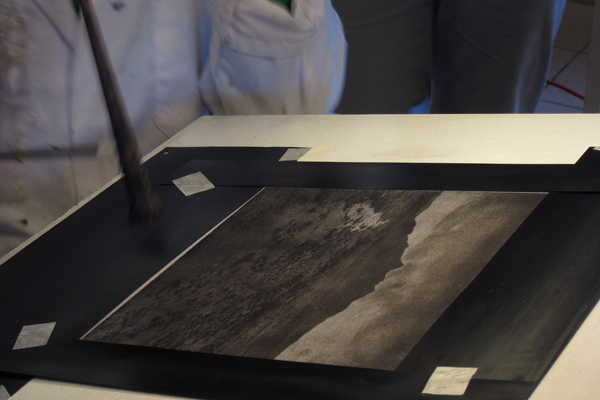 The ink application requires considerable skill, and as a result no two prints are alike. 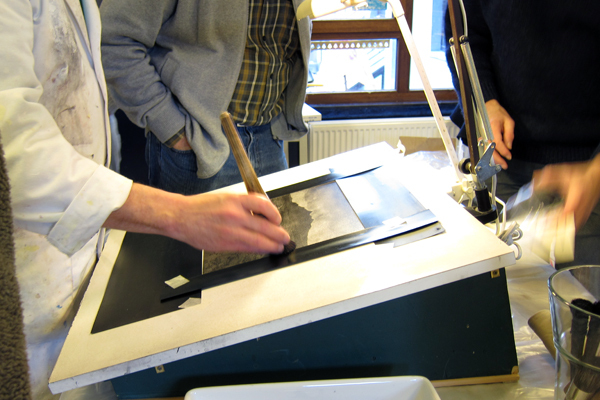 The advantage of bromoil is that you can enlarge a negative using your regular enlarger as the paper has a normal sensitivity to light. 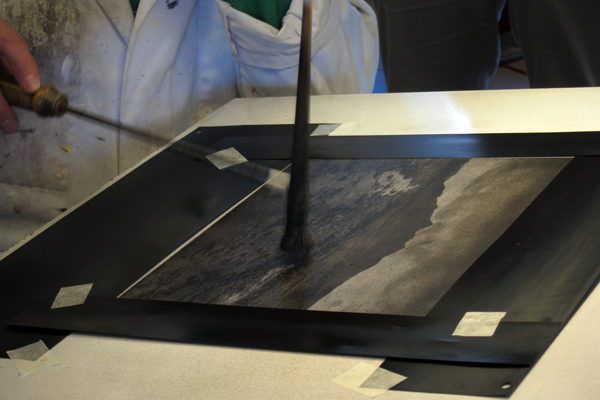 The oil process requires you to contact-print a negative because you can’t use your enlarger for exposing your paper. It needs UV light to work, meaning you’ll have to create a negative the size you want your final product to be in. Unfortunately there are (hardly) any papers available (screw you digital world!) which you can properly use for the bromoil process. Thus reverting back to oil printing without the “brom” will be inevitable in the end. I started a bit late with taking photographs as I was too busy watching so the images will start explaining things a bit further down the road. The papers have been prepped already, exposed, developed, bleached, rinsed and the inking has already started. After being soaked the paper gets placed on your working space and attached. With normal household paper you can get rid of the excess water; you only want the swollen gelatine to be wet to repel the ink. The inking starts when there is hardly anything visible on your paper due to the bleaching. You can however see the relief and then you kind of know the inking will have its effect. The parts where the gelatin has hardened due to exposure the ink will stay (dark parts) and the parts where the gelatin is soft it absorbs the water which on its turn will repel the ink (lighter parts), hereby forming the image. The ink can be applied by a small roller and / or different brushes., the first being the least precise of the two. 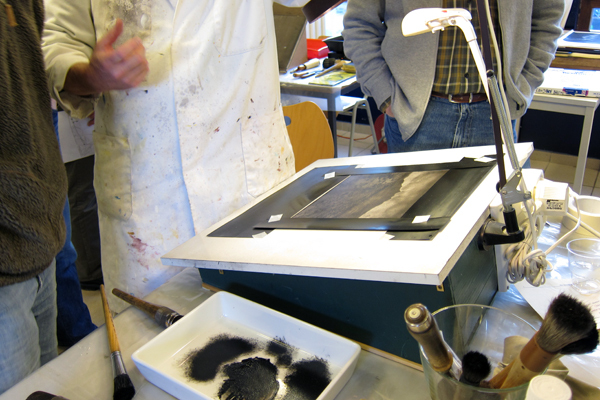 You can also start applying the ink with the roller and working the image with brushes. In my understanding you first make sure you create an even layer of ink on the paper, then making sure it gets into the emulsion and than you start working the image by creating the lighter parts and the darker ones. The more ink the darker and by tapping on the paper with a clean brush you can remove ink in order to create lighter parts. 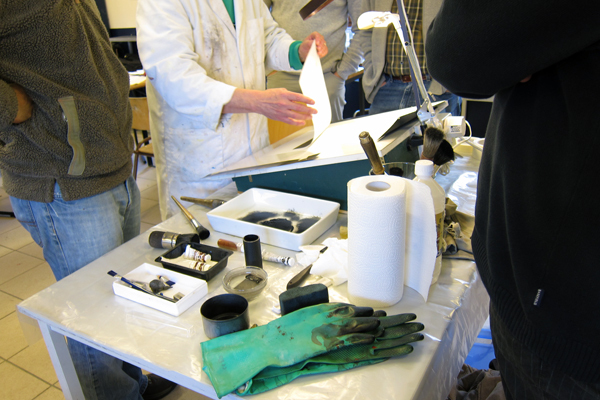 Here you can see some of the materials used, brushes etc. When you think you stippled enough (and or the print is drying up which means the inking will no longer have effect) you have to soak the print again. This will wash of the excess ink on the soft gelatin parts cleaning up the light parts giving you a better understanding of the light parts in the image and where you would want to improve it further. After a minute or so get the print out and place it back on your working space, repeating the household paper session of course to get off the excess water. This has to be done in such careful manner as not to smear the ink all over the image and ruining it. ..And continueing the stippling and whatnot.. Anyway, I had a wonderful Sunday afternoon and I hope my post was not too messy, unclear and full of flaws. If so, let me know, I’ll adjust it asap as it’s important the information given is as accurate as possible. Again looking forward to the next Picto Benelux Meet! !